What Happened to Quality Teen Movies? Katie Paolano '16 controls the ball against Wesleyan in their final game. Field hockey saw their season come to a close after falling 1-0 to Middlebury in the NESCAC Semifinals held on Saturday, Nov 9. The team finished with a 13-3 record and a near perfect 9-1 record in NESCAC play. Each team remained strong defensively for much of the first half with neither side mounting-threatening offensive drives. The first shot of the game came twenty minutes into play from Panther Alyssa DiMaio. 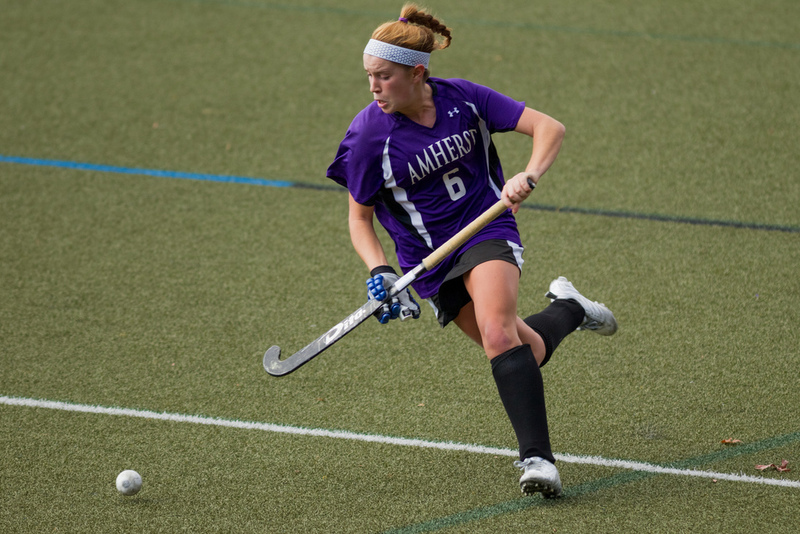 Amherst keeper Rachel Tannebaum ’15 was able to make an impressive pad save to keep the game notched at zero. Amherst responded with their own offensive effort. The Jeffs transitioned well and won a penalty corner. Alex Phillie ’14 received the insert pass and sent it to fellow captain Krista Zsitvay ’14. Zsitvay was able to beat the Middlebury goaltender but Meredith Rowe made a defensive save to prevent Amherst from taking the lead. Middlebury went on an offensive tear with ten minutes remaining in the first half. They had two strong chances on goal, but Tannenbaum was there to make two of her five saves on the day. Catherine Fowler did find the back of the net for Middlebury, but the referees deemed it to be an illegal shot, keeping the game scoreless heading into the half. After 59 minutes of scoreless play, the Panthers took the lead. Fowler carried the ball up the right wing and centered a pass. Pam Schulman was able to redirect it, giving Middlebury a 1-0 advantage. Amherst did push for an equalizer. Their best opportunity came off a penalty corner with eight minutes to play, but the Middlebury defense was able to clear the ball and secure the win. Middlebury went on to defeat Bowdoin in overtime of the NESCAC Final on Sunday, Nov 10. The Jeffs had an impressive season, earning a thirteen game win streak throughout the majority of the regular season and the playoffs.